Up at 8:30 am. I let my laundry soak in a bucket and decide that today's a chill day. There's nothing to do here, but there is a nice used-book shelf. The restaurant is pretty good, and the staff, especially Siad, is really nice. Unfortunately, these wonderful cabins on the beach are actually a bit of a pain. There's no furniture other than a funky cloth-sided closet, a bed, and a mosquito net. "Once out of the canyon it is flat all the way to Suez, about 400 km. It can be done in three to four days - with a feeling of remoteness most of the way. For the first 100k after Nuweiba there is no water, so it is a good idea to carry about 6 liters of water per person. 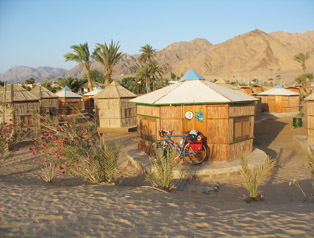 There are no hotels between Nuweiba and Suez, but camping is easy. Food is available in Nakhi, about halfway… From the end of the [canal] tunnel it is about 20 km to Suez, and another 110 km to smoggy, frenetic Cairo. Cycling in this city is not recommended unless you have nerves of steel." I've got to be honest: there's little about this description that sounds compelling. And since tomorrow's the 12th, and my flight is the 18th, it's not even do-able. Good. 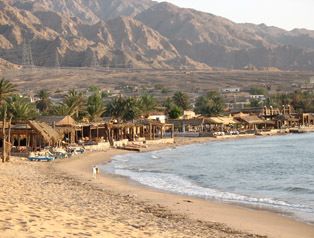 I'll ride south instead, to Dahab, which the guys at the hotel back in Petra said was a great little resort town. Tomorrow's plan is to get an early start, so that I can cover most of the 50 k to Dahab before the heat kicks in. I'll select a hotel, then perhaps I'll get a dive or snorkel in, or even some kiteboarding. Then I'll need to figure out a bus to Cairo where my last hurdle will be getting the bicycle boxed. Up at 5:10 am, breakfast at 5:40, the usual inefficiencies and finally rolling at 6:40 am. I'm loving the pace. At the turnoff to Dahab I come to a police checkpoint. Egyptian security goes through each of my four panniers. I don't seem like the obvious terrorist suspect, and this seems a slight waste of time, especially when large trucks driven by Egyptians pass through with nary a glance. Nevertheless, I'm in Dahab at 11-ish. 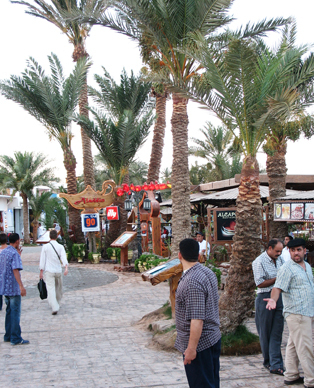 Dahab's very nice, and tourist-friendly. I check into Penguin Village, and enjoy a very nice room with partial ocean view, for 80 EP ($14). I bicycle ten minutes south to visit the resorts along the lagoon. It's a beautiful strip, bustling with European windsurfers. Apparently I cannot rent kiting equipment without being checked out, and the one instructor is booked for the next several weeks. Oh well. Went scuba diving today. Two dives for = $72. Glad I did it, but I'm not sure that this part of the Red Sea lived up to all the hype. It's too soon to head toward Cairo, so I guess I'll hang out one more day, then… continue biking south. I decided yesterday evening that I would bike to Sharm El Sheikh. Lonely Planet hates the town, and I expect that I will too, but I feel like riding. Jeez - I'm finally getting good at this! I've got nothing to do today, except basic chores. I get a haircut, have two of my shirts washed, get some more Egyptian Pounds, then futz about, shopping for a paperback. Lonely planet says that the best bus company to ride with in Egypt is SuperJet, and that there's a SuperJet just outside of Sharm. We'll see if that turns out to be true. And the cabins are definately beachfront. This is the view looking south - just 30 meters or so from my cabin. 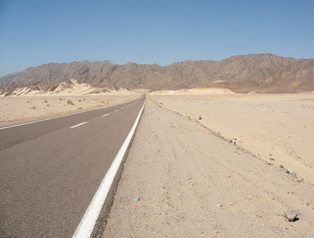 The scenery on the ride south to Dahab is pretty barren. 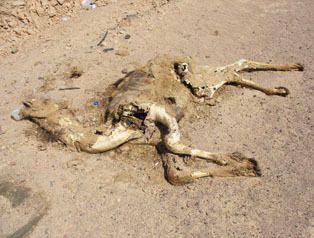 Even camels found it pretty rough. Dahab's the easiest town I've been in since Cappadocia. Great hotel selection, great windsurfing and diving, great food... you name it.